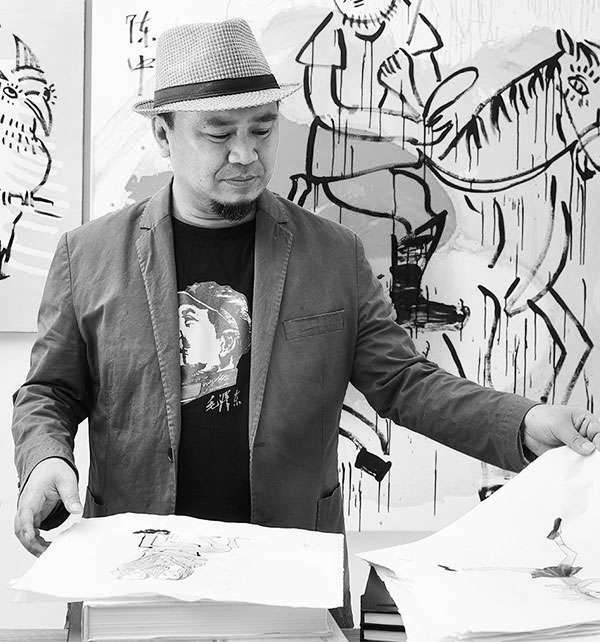 Meet the latest artist to join the Art Series family, Zhong Chen. Experience The Art of Joyful Journeys and learn about Chen's life and his influences. 1. Born 1969 in Zhongshan, China. 2. Attended traditional Chinese calligraphy classes from the age of 12. 3. Arrived in Australia in 1989, aged 19 and settled in Adelaide. 4. Attended University of South Australia and graduated with Honours from the Adelaide School of Art in 1995. 5. Won the highly coveted Samstag award, a scholarship to the Chelsea College of Arts in the UK. 6. Influences include Jean Michel Basquiat, Elizabeth Peyton and Gavin Turk. 7. Works across diverse styles including highly gestural brushwork and gridded compositions. 8. Much of his work explores Chinese Australian identity. 9. Refers to Chinese landscape painting, kung-fu culture, Chinese horoscope and Chinese literature in his work. 10. Proud local resident of Box Hill, excited to welcome the hotel to his vibrant local neighbourhood. Before you end up in a mountain of socks-for-everyone, have a perusal through our list of art inspired festive gifts, full of creativity, wit and practicality - sure to inspire even the most hard to please of sorts. Come and sleep over at The Chen, during Chinese New Year celebrations, for your chance to take home an original Zhong Chen masterpiece.